The Presentation mode allows you to create a real time 3D presentation of your design. Presentation Mode is a fully interactive tour of every detail of your design. In presentation mode, Pool Studio swimming pools and VizTerra water features will fill with water and you will be able to hear the sounds of water and fire features. You may also choose ambient sounds to play in the background. Getting to Presentation Mode: In order to explore your project in Presentation mode, go to the Finalize Phase and the Presentation Stage. Click the “Create Presentation” icon on the panel. You can also view the Presentation Mode by selecting View Presentation Mode under the File Menu. Navigation in the Presentation Mode is simple. Moving the mouse around will change the direction you are looking. Pressing and holding the left mouse button will move you forward in the direction you are looking. Pressing and holding the right mouse button will move you backwards from the direction you are looking. ESC: This will bring up the menu at the bottom of the screen, where all of these commands can also be found. X: Exit Presentation Mode and return to the program. R: Reset the view to where the Presentation mode began. A: Automated tour. The view will automatically rotate around the pool in Pool Studio and the center of the grid in VizTerra. Space Bar: Same as A, starts up the Automated Tour. P: Take a picture/screenshot of your presentation. This command will take a picture of your current view in the presentation mode. The screenshot will be saved in the screenshots folder. F: While in Walk mode, enter Fly mode. 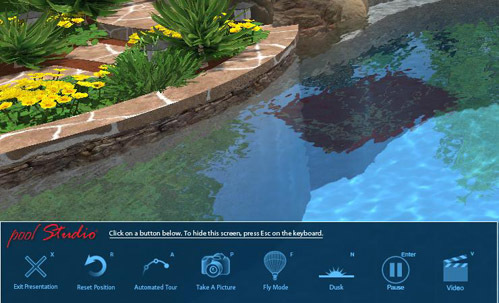 Fly mode allows you to “fly” anywhere in the 3D view. W: While in Fly mode, enter Walk mode. Walk mode plants your feet firmly back on the ground so you can walk around. N: Go from day to dusk to night. 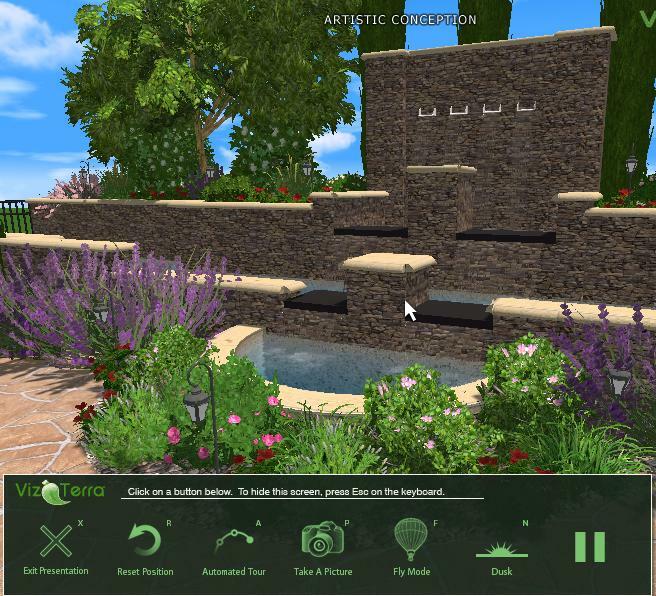 Enter Key: Play/Pause item and landscaping animations. This command will turn item animations on and off while in Presentation Mode. V: Start/Stop recording video of your presentation. This command will start the video capture feature allowing you to create a video of your presentation. A 3 second countdown will tell you when your video will start recording. Your walk and fly speeds will be lowered while recording. This can be adjusted under View, Configuration, on the Video tab. Pressing the button again will stop the video capture and save your video file. Video files are saved into the screenshots folder. When you exit the Presentation Mode, your video files will be automatically compressed.